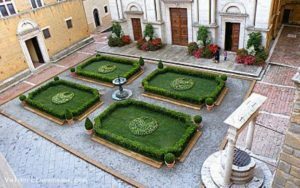 Pienza’s main square will host magnificent reproductions of a Renaissance garden from May 1 to 13. Other public venues such as piazzas and streets will also contain a series of similar themed floral installations that incorporate hedges typical of the period. 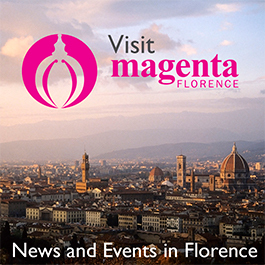 A city-wide plant and flower market is also scheduled on the final weekend of the event, on May 12 and 13 that will also be located in piazza Dante Alighieri. The unspoiled beauty of southern Tuscany is not easy to come by any more, and should one stumble upon it in the Val d’Orcia where Pienza is located, it launches one straight into another perspective, and another time. The landscape is gentle: a series of rounded waves, which break towards an infinite horizon dominated by the profile of Monte Amiata. This timeless land encapsulates everything that is built within its realm, something that Aeneas Piccolomini understood more than any other. He knew that his legacy—a perfect monument to humanistic thought—would never last in Rome or Florence or any other big, ever-changing city. So he built in Pienza, where it lives on to remind us that great ideas, transformed into art, can be made to last almost forever. Aeneas Silvius Piccolomini (1405-1464) was born in the town of Corsignano, into an exiled and impoverished Sienese family. After years as a diplomat and jurist, this exceptionally brilliant man of letters was made a cardinal and only a few years after, in 1458, he was elected Pope. As Pius II, he was determined to turn his small hometown into the ideal Renaissance city. In only three years, he transformed Corsignano, giving the town city status and a new name, Pienza, after himself. To help him realize his dream, the pope turned to a leading humanist scholar of the day, Leon Battista Alberti (1404-1472).. The outstanding space that Pius commissioned exists today just as he and Alberti’s illustrious pupil, Bernardo Rosellino (1427-1479), planned it. A perfectly ordered stage for a Renaissance play, the trapezoidal town square is flanked by Renaissance palaces and dominated by the town’s Duomo. All of the structures seem to pull together in harmony as one distinct, well-ordered piece of art. The Cathedral reflects the spiritual values of the medieval Church within and 15th century Humanism without. Its interior is late Gothic; its tall windows and south facing apse floods the three equally tall vaulted aisles with light. Altarpieces by Siena’s Renaissance painters—including Giovanni di Paolo, Matteo di Giovanni, Lorenzo di Pietro (known as Vecchietta) and Sano di Pietro—grace the altars. The travertine facade of the Cathedral incarnates Rossellino’s and Alberti’s studies of ancient Roman architecture. Its unadorned harmony and color are exceptional.